In hinterland container transportation the use of barges is getting more and more important. 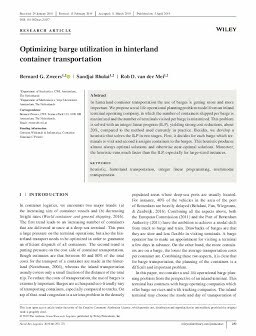 We propose a real‐life operational planning problem model from an inland terminal operating company, in which the number of containers shipped per barge is maximized and the number of terminals visited per barge is minimized. This problem is solved with an integer linear program (ILP), yielding strong cost reductions, about 20%, compared to the method used currently in practice. Besides, we develop a heuristic that solves the ILP in two stages. First, it decides for each barge which terminals to visit and second it assigns containers to the barges. This heuristic produces almost always optimal solutions and otherwise near‐optimal solutions. Moreover, the heuristic runs much faster than the ILP, especially for large‐sized instances.